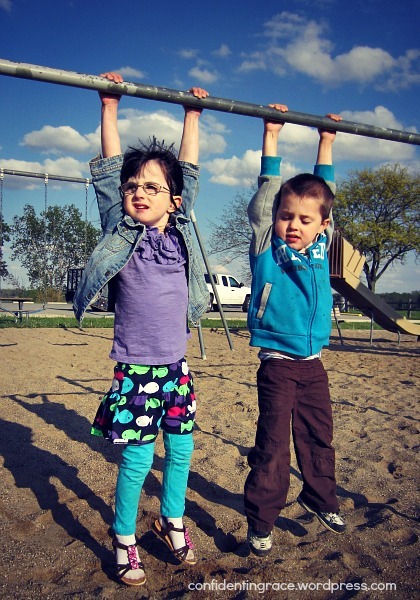 If you haven’t visited this blog before, you might not know that we have a set of twins (boy/girl) who are now four years old. 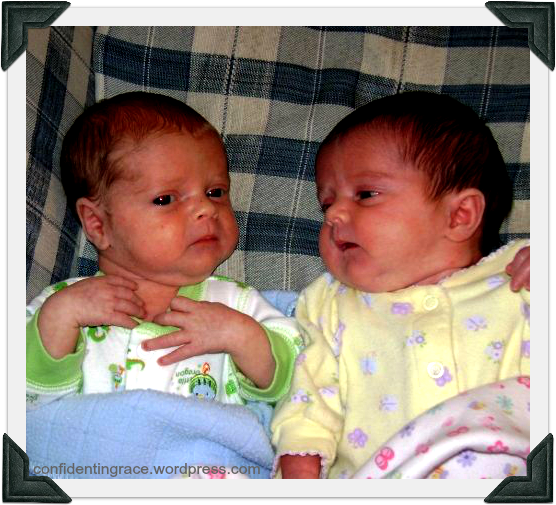 I never imagined myself having twins, and in fact, I had mixed feelings at first (read the story here). However, our twins have brought a doubled joy to our lives that I could never expected. There is something so precious about watching them sleep side by side or hold hands as they walk down the sidewalk. Observing their unique bond has been a true privilege. I hope they will always be best friends of sorts even though they are different genders! 1. Divide and conquer. Whatever task you face, it can be much easier to handle one at a time. For example, I read many success stories from mamas who simultaneously potty-trained their twins. It seems that for these blessed mothers, what one twin did, the other followed. 2. Kill two birds with one stone. Some twin tasks are just easier to do together, such as diaper changing (one right after the other, of course), nursing (huge time saver if you can get the hang of it), going to the doctor, bathing, and feeding snacks or meals. When you already have all of the “stuff” out, you might as well get it over with for the other twin, too! I even learned such talents as double burping, which only lasted a month or two. 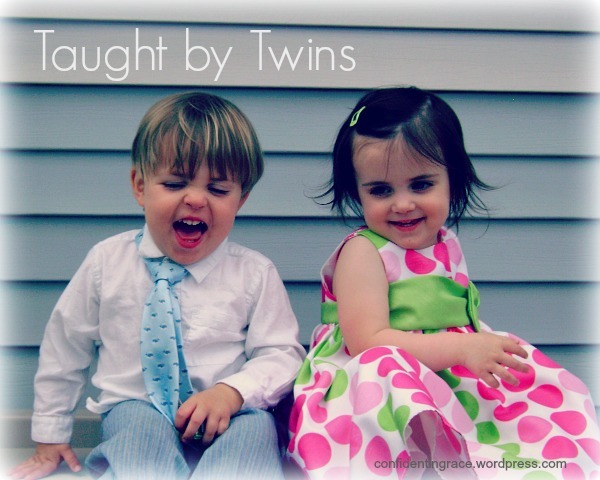 Part of finding my groove with our twins was learning which technique worked best for which tasks – either #1 or #2. 3. Set up stations! When the twins were infants, this was a lifesaver when it came time to prepare a meal, or work with an older child, etc. I had a rotation of baby devices for them and when they grew weary of one (after about 10 minutes), I would quickly rotate them to the next thing in line. Instead of having two of everything, we found we only needed one of most things and thankfully, many of these devices were given to us. So, at one point in time we had out an exersaucer, a jumperoo, a bouncy seat, a playmat, and a walker (before the walker days, we had a swing). 4. Identify the tough times. We definitely had specific times of the day that were much more difficult than others. Meal times, bedtimes, and late afternoon seemed to be the worst for us. Once we identified those tough times, we were able to problem solve to cut down the stress. If all else fails, then…. 5. Enlist helpers! By far the best thing we ever did was to accept the gracious offers of friends and family to lend a helping hand. Many ladies from church took turns helping me with afternoon feedings (my husband worked second shift at the time) even when the twins were quite small. I would either pump ahead of time or I would take that opportunity to nurse one infant at a time and the company could burp or entertain the other twin. For a few months I also enlisted the help of one of our teenage nieces. I was able to pay her very little, but she loved coming over to help with the kids. It was totally worth the expense. Twin mamas, do not be afraid to ask for help, especially in the early months – it will save your sanity! 6. Schedule, schedule, schedule. I wasn’t a very schedule-oriented mom when it came to nursing or even napping our first two children. Our firstborn sort of fell into a schedule all on his own, and our middle child fought any sort of schedule from day one! However, by nature I’m a planner, so I like at least a loose form of organization. And after struggling with our strong-willed middle child, I was determined to start off right. 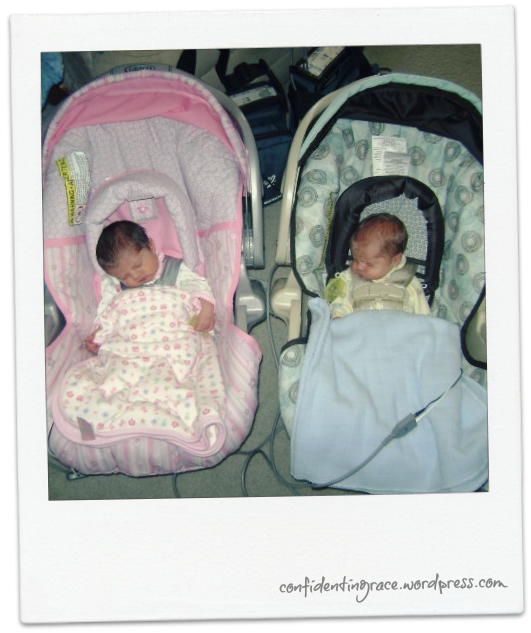 Since our twins were born prematurely, they spent time in the NICU and came home already on a strict feeding schedule. So, we were already off to a good start. 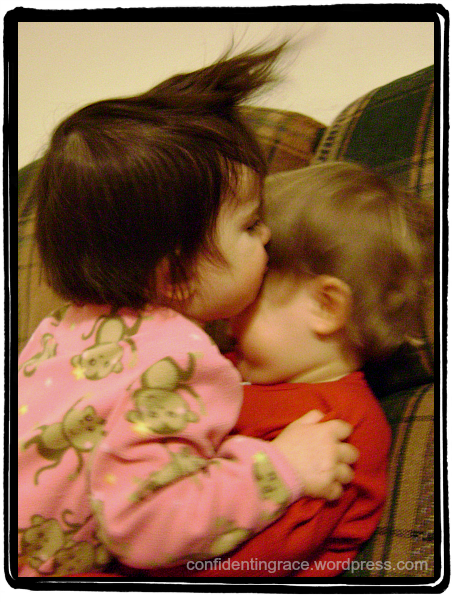 However, our infant son was not always happy to keep to the same schedule as his sister. It was hard work to find a happy medium, but I knew I wouldn’t handle feeding and napping at different times very well. Persistence paid off, and the majority of the time, they ate together and napped together. Find a sort of schedule that works for you! The best pattern to follow for those first 6 months or so is: eat – wake time- then sleep, which is the complete opposite of what many babies naturally do. However, this pattern sets your infants up not only for feeding success, but for sleeping success as well! 7. Invest in the gear that makes your life easier. Being a parent is hard work. Being a twin parent is sometimes doubly hard work! 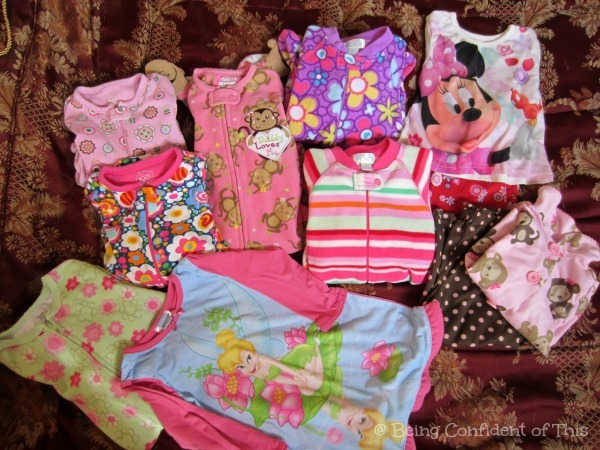 Some baby gear makes that work a lot less difficult and is worth every penny. For example, my husband and I debated about whether or not to purchase a double snap-n-go stroller. It’s basically a metal frame stroller that the infant carrier car seats can snap right into. Thanks to some generous gifts, we had the necessary funds and decided to go ahead and purchase it. Next to my twin nursing pillow, it was the best purchase we ever made for the twins! It made outings much easier, especially those I had to navigate alone – going to church, going to the store, going to the library, going to the doctor. 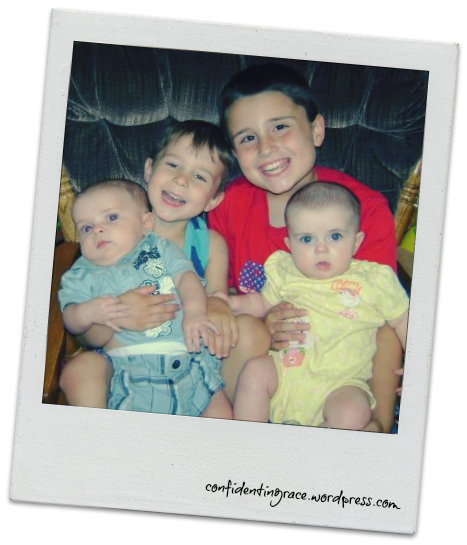 I was no longer confined to the house, which made me and our two older children very happy! Later we switched to a Schwinn double jogging stroller, courtesy of my father-in-law’s fabulous auction skills, and the last stroller we owned was a double sit-n-stand, which I highly recommend for the toddler to preschool years. When one is tired of sitting in the front seat, you can switch them out to standing, kneeling, or even sitting in reverse in the back seat. Did I mention that having twins also taught me to lower my standards a little? 9. Remind your older children that they are special, too! Sometimes older siblings have jealousy issues, and then sometimes they have twin fame issues. 😉 Twins not only require a lot of extra attention from mom and dad, they also attract a lot of attention when you are out and about. People love to look at them and ask questions about them, which might leave your older children feeling a little ignored or neglected. Going on one-on-one dates really helped our older children when they were exhibiting signs of attention-deprivation. Also, relatives stepped in often and took one or both of them for special activities or sleep-overs. Sometimes it’s as simple as mentioning something special about your older children when people are ooo-ing and aaahhh-ing over the twins. 10. Remember that it does get easier! Those early months are oh-so-tough. I well remember the sleepless nights, the double diaper blow-outs, the duets of screaming banshees, the illness multiplied by two in winter months, and sometimes it felt like there was no light at the end of the tunnel. But there is! Those twins will grow up and while you’ll always have two at the same stage, rather than one, as they grow older it feels a lot less like double duty and a lot more like having two children very close in age. Believe it or not, our twins are so different in looks and personality that sometimes I momentarily forget about their special bond! Focus on one day at a time, until you can focus on one week at a time, and eventually one month, and before you know it, you’ll be thriving instead of just surviving! 11. Count your blessings. On those really rough days, the ones when you barely limp across the finish line that we mamas like to call bedtime, try to let go of the challenges and remember the blessings of having twins. There are many difficulties in raising twins, but there are equal, if not more, unique blessings wrapped into those challenges. So when the days are dark, count those blessings. Remind yourself of the things that you enjoy about your double gift, how one baby catches the other’s eye and both faces light up, how they “talk” back and forth to one another, even answering one another’s cries. Remember those good things; cling to them! 12. Pray. It sounds simple and everyday, but it’s not. Prayer is powerful! Some days I woke up after a sleepless night asking the Lord for supernatural strength because I just didn’t have it in me. He literally carried me, not just mentally but physically, through many of those early weeks or even months. I know others were praying for me, too – the power was almost palpable at times. While I didn’t get a direct answer to that question, I was overwhelmed by the peace of His presence. And suddenly, I realized that maybe it didn’t even matter as much as I thought it did. If you have young twins or are about to have twins (or even children very close in age), I hope you find this post helpful. 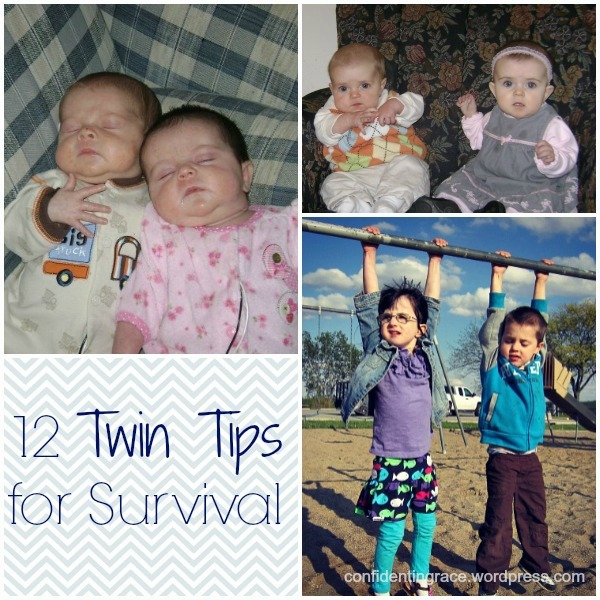 And if you are already a twin mama and you have some advice to share, please feel free to share in the comments! I love finding out what works for other moms and seeing if it will also work for me. *This post makes use of affiliate links. Jen is a participant in the Amazon Services LLC Associates Program, an affiliate advertising program designed to provide a means for sites to earn advertising fees by advertising and linking to amazon.com. Thank you for helping to support this blog! Sharing this post with: How Do You Do It? Close to five years ago, God chose to bless our family in a totally unexpected way. It was a blessing I never would have chosen for myself, one I was completely unprepared for and one that brought with it a great deal of anxiety. It’s a blessing that often continues to challenge me today. The blessing we received was the gift of two children at one time – twins! From the moment we received that awe-inspiring news, I began to worry. The truth is that I like to be in control; I like to plan things in advance. I like life to be organized and tidy, not uncertain or chaotic. Two babies at once was not part of my plan! In my turmoil, I didn’t know whether to yell, “Praise the Lord!” or break down in tears. Thus, I spent the early portion of my twin pregnancy struggling with fear, worry, and what if’s that I never even considered with my first two pregnancies. What if we lost one or both of them? What if they were born prematurely? What if they had medical issues? What if I had to have a C-section? What if I just couldn’t handle twins? What if our middle child (then our youngest) couldn’t handle being displaced by two siblings at once? What if I couldn’t figure out how to nurse two at a time? What if we didn’t have enough money? The doubts strung out in a long line. On top of the what ifs, I was riding the roller coaster of amplified pregnancy hormones as a result of carrying two babies at one time. One moment I felt euphoric excitement and extreme gratitude for this unexpected blessing and the next – sheer terror. 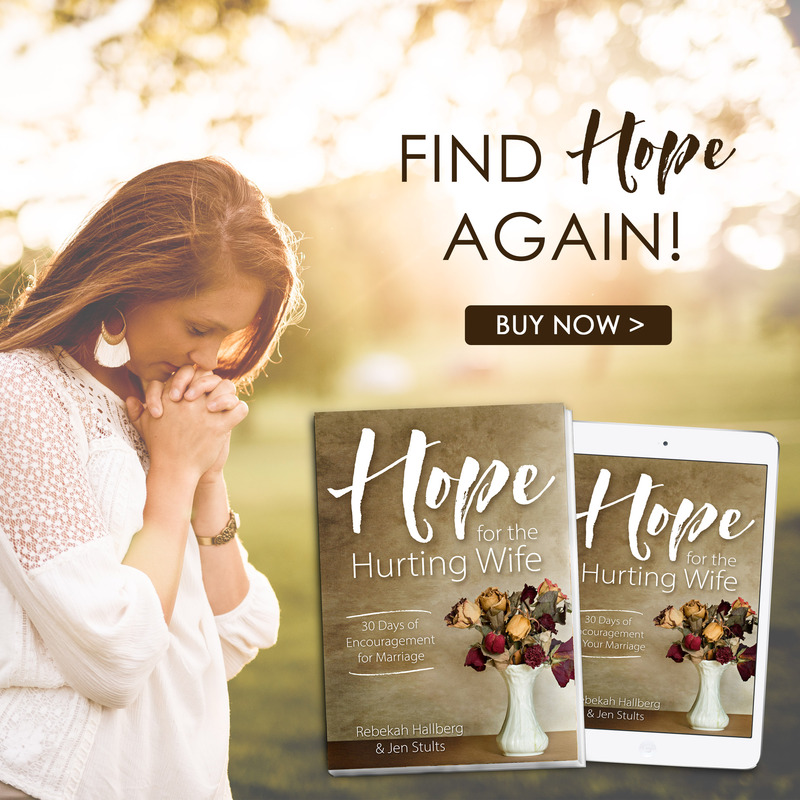 Even my fear became complicated by the addition of guilt, guilt for sometimes thinking, “it would be easier if it was just one baby,” or “this wasn’t in our plan.” As soon as the errant thoughts entered my consciousness, I felt a shame like no other. So many women would give anything to carry just one baby, and here I was complaining to myself that I was being blessed with two! I knew I was sinning. 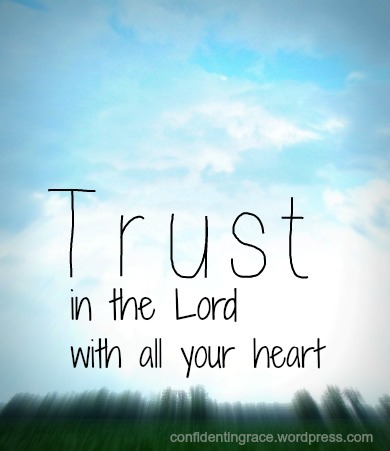 I knew I needed to trust God more. I knew that He was in control! I knew His grace was sufficient for me. If He chose to give us twins, then He knew we could handle it with His strength. I prayed constantly over these truths, but I was having so much trouble believing them. I put up a good outer front – it was easy to share my excitement with others and leave out the more shameful feelings. One day when I confessed my worry that I would be inadequate, a wise woman at my church kindly told me that God knew I could handle two at once, or He would not have entrusted these babies to me. A light bulb burst into light, and I suddenly saw my unexpected twin pregnancy anew, as an honor, a privilege. Instead of reveling in my blessing, I was wallowing in worry. I was wasting this unique experience. Little by little, the Lord began providing for our physical needs, as if to provide physical evidence for my skeptical spirit. He knew we needed a larger vehicle, so He provided a minivan for our family at very little cost to us. He knew we’d need double the clothing, so He sent neighbors and friends with bags of gently used clothing and other baby necessities. Our church family collected gifts for us also, including a mountain of diapers that tumbled over onto the floor of the bedroom closet. We received countless gift cards, often from unexpected sources! 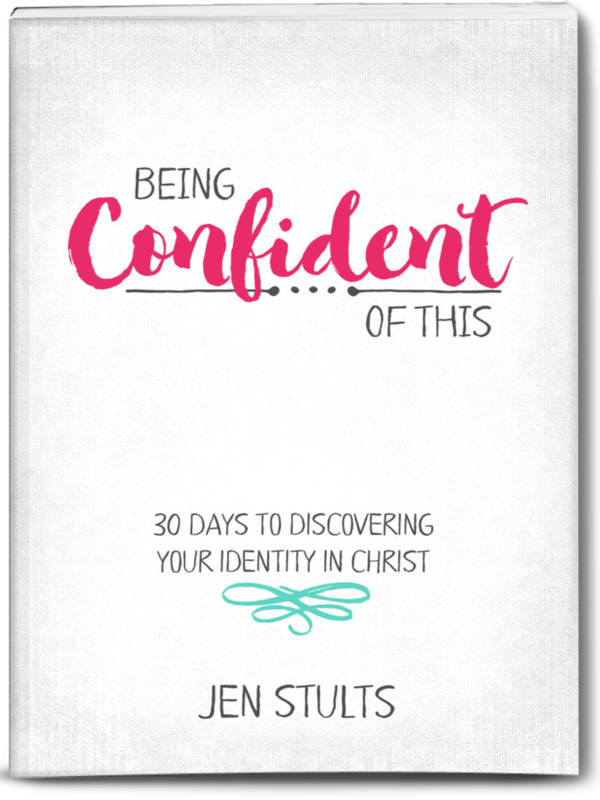 I was completely overwhelmed by a God who takes seemingly impossible situations and works out the details without any help on our part, and I praised Him for meeting our needs and encouraging us on this new journey. My pregnancy progressed as uneventfully as a twin pregnancy can and as I neared the end, I thought we might actually make it to full term. The specialist I was seeing joked about how great my uterus was and how well my body was built for carrying babies. I beamed, pleased my body was cooperating so nicely. All was well. And then the swelling began: first my legs, then my hands, and finally my face. I knew it was pre-eclampsia because I’d experienced it twice before but never this quickly. I called the specialist to report my symptoms, already knowing the answer I would receive. Come to the office immediately. 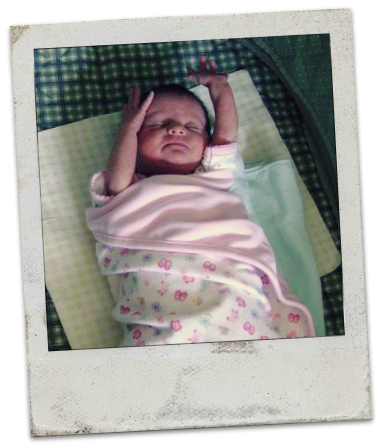 Not long after arriving at the office, I was ushered over to the hospital and told that a C-section was imminent. C-section: that dreaded word that made me want to run in the opposite direction. Furthermore, my pregnancy had only just reached 34 weeks, so I required steroid injections to help mature the babies’ lungs before operating. As excited as I was to meet our two bundles of joy, fear of the unknown crept back in, slowly and silently. I feared the C-section recovery. 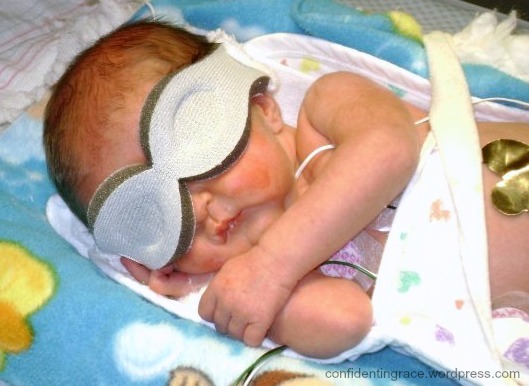 I feared the health issues facing my premature infants. Fear slipped in little by little until suddenly, it was upon me and I could scarcely breathe. I momentarily forgot that God was in control. I forgot that He had demonstrated His provision over and over again for the past seven months in some very big ways. I forgot that He promises to be faithful, and I had a pity party for myself right there in my hospital bed. I cried. I worried. I wallowed in fear, took a bath in its darkness. I wondered why. Why, God? 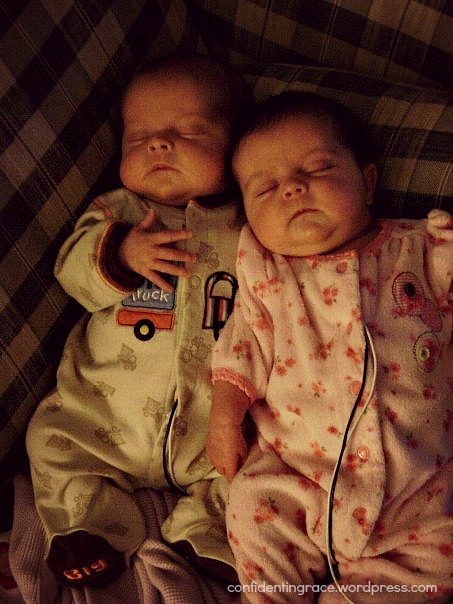 Our twins arrived the next morning via C-section at right around five pounds each and were quickly whisked away to the NICU. It was the beginning of a very long week. We existed in a sort of haze, but we survived. I put off dealing with my fears and thought surely things would get better once we settled in at home. Surely I wouldn’t worry so much having them right next to me instead of in another section of the hospital. However, when we finally did make it home, I realized very quickly that it was just the beginning of a long haul. Both babies came home on apnea monitors, which made just about everything more difficult: feeding, sleeping, travelling, and so forth. Additionally, we had already spent an entire week apart from our two older boys, including missing our oldest’s birthday party, so they were understandably needy, as well. The nights were even more difficult as we woke ourselves every three hours to feed babies that needed assistance, and then I still had to pump. It was exhausting, and I continued to worry about them. Did they drink enough? Would they gain weight? Would I ever be able to nurse them? What should I do when they both cry at once? How can I get them on a schedule when one seems to need more sleep than the other? So much uncertainty. At first, I read a lot of literature on parenting twins, scheduling, and so forth. I worked at getting them on the same schedule and tried not to feel guilty about the lack of time with our older children. I decided to focus less on doing everything right and focus more on just surviving the day to day grind. I spent time in the Word. I prayed ever more fervently for strength and wisdom. He told me to let go. Quit worrying. Trust Him that even if I somehow did something wrong, my children would still be okay. It took a few months to come to grips with the fact that my prior parenting experience held little value in this new four-child-family world. I had to adapt my lofty ideals to techniques that would actually work for our family. I even resigned myself to the fact that I might not ever be able to nurse the way I wanted to (although we did eventually figure out how to tandem nurse). I gave in to my infant son’s desire to be held…a lot..and my daughter’s desire not to be swaddled. I learned they were different from one another. I learned to find quiet moments with my older children and to understand that jealousy was just a part of life for siblings, whether they have one sibling or many. One day as I sat on the floor with my incredible infants, it dawned on me that we were no longer just surviving; we were actually THRIVING! 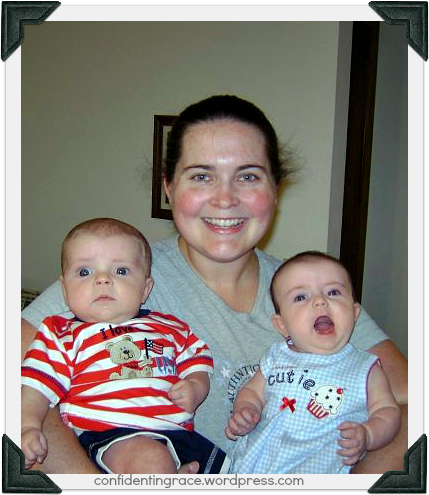 All four of our children were happy and despite continuing medical issues, the twins were growing and learning. I even felt more connected to my husband as our busy household required more teamwork than ever before. In fact, despite little sleep and little “me time,” I was superbly content. Watching my two infants smile at one another, holding them both in my arms at once, feeding them together – all of these things brought me a greater joy than I ever could have imagined. If you have ever seen two babies giggle and smile at one another or sleep peacefully side by side, then you know the joy I’m referring to. It is overwhelming in its beauty. I admit: life wasn’t always pretty. We still had difficult days, but the smooth days eclipsed the rough ones. I thanked the God who gave me a blessing I didn’t deserve, the blessing I didn’t ask for, the blessing I would never have chosen for myself. When God gave us twins, He taught me a few very valuable lessons that I try to carry with me still. He taught me that Philippians 4:13 really IS true. 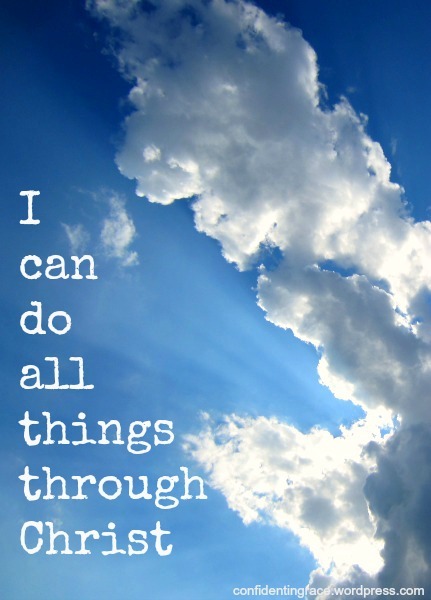 “I can do all things through Christ who gives me strength” isn’t just a nice saying, but He really can give me physical strength for the day! He also taught me that I needed to relax as a parent. So what if our school age son still doesn’t know how to tie his shoes because we had twins the year before he started kindergarten? So what if I don’t feed my children a food-pyramid-perfect meal three times a day, every day? 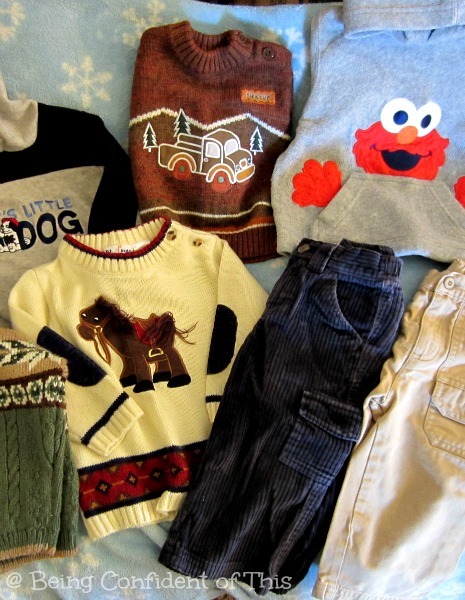 So what if my oldest occasionally runs out of clean clothing? So what if the tv is on more than I’d like? There are so many more important things in life than the details of the day to day grind of being mother to a larger than average family. Things like relationships. Love. Attentiveness. Contentment. The Lord showed me that if I want that abundant life my heart so desires, I need to do the opposite of what makes sense to me. I need to quit trying harder, quit controlling more, and just relax. Relax in His grace. Relax in His presence. I don’t have to control it all because He is in control. If I remain close to Him, the details will work themselves out, often in a more stunning way than I ever thought possible. 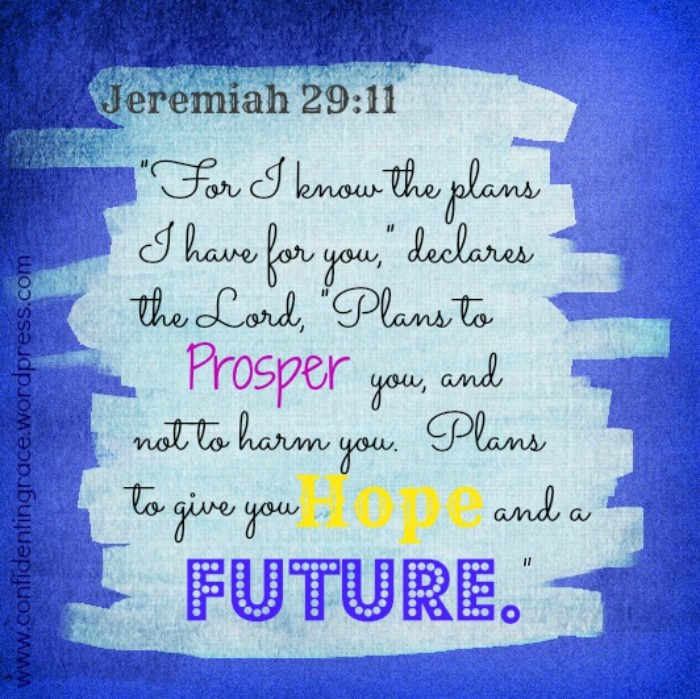 Jeremiah 29:11 became very real to me. I’m profusely thankful that His plans for our hope and future included twins. Like the Israelites in the desert, I would have settled for a return to Egypt rather than experience the glory of the Promised Land. But He had a bigger blessings in mind for us. Can you recall a time when God’s plans failed to match up with your plans? What were the results?